Item is probably bugged, since it has the old wording of spellpower. Yeah, soon it will say Increases Spellpower by 100. No one's said it, but this got a new model on 3.2. Restoration druids might want to pick up these instead of the leather version: Grips of the Secret Grove. Same stats but these have haste instead of crit. Both are from badges and cost the same. 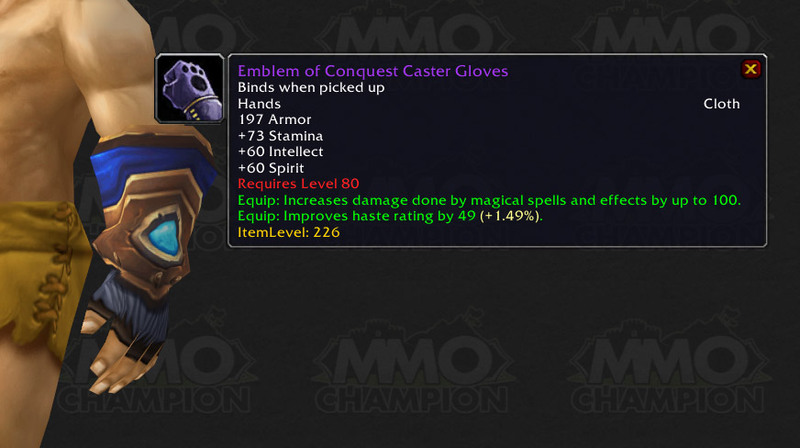 For the purpose of transmorg, this can be a replacement for Conqueror's Kirin Tor Gauntlets. They share the same model AND color, so you can use this to match the Mage t8.5 set.